Great story Keith, thank you for sharing it. I started counting spoken crutch/filler words about ten years ago when I joined Toastmasters. Thank you for the blog entry. It’s great to know of a fellow “ah” counter. Stan the man! Sorry for your loss, sir. This is a most heart-wrenching account of what a real friendship should be like. Stan Isaacs was talented and wise, knew what was needed and found it in you. I’m so glad he did. I appreciate you sharing this most personal story with us. It shows how you revere great influences in your own life. I wish I had met someone like him in my formative years. To know someone as great as Mr. Isaacs is an honor and a distinction that can be carried with you wherever you go. I send my deepest condolences to you and all who knew him. A sad day and a great loss for many. Beautiful tribute, Keith. What a story. Wonderful tribute, Keith. Anyone who reads this will immediately be able to appreciate your great admiration, respect, and gratitude towards Stan. That article he wrote about you was spot on & prophetic. Even at 22 he could see your potential for bigger and better things. And he was so right. He must have had a great eye for talent. I loved the part about the “you know” assignment and how it lead to Stan writing a column about you. Fascinating. (BTW, the words “you know”…..yes, they are an insufferable verbal crutch.) The bottom line to all of this, in my opinion (if it means anything), is that whether Stan was directly or indirectly responsible for you getting into television, the fact remains that you never fail to acknowledge or thank someone who has helped you or contributed in some way to your success. And that is an admirable quality. There are some who have very short memories when it comes to showing gratitude or appreciation to someone who was instrumental in making their network successful (they shall remain nameless), not to mention some individuals who were given a leg-up in their careers (also shall remain nameless). But we FOK know what you did and we will never forget. They may act like you never existed, but you will always exist in our hearts and minds. You’re a man of strength and courage and you showed it every day on “Countdown”, no matter the criticism. Stan recognized that you had “guts” (not the word you used LOL) even when you were a kid of 22. So God bless him for realizing how different and special you were back then. I feel that even if Stan hadn’t written that column, somehow you still would have found your way into television, maybe just not as quickly. There’s no holding back someone with your talent and brilliance. You’re a very unique individual, Keith, and in a class all by yourself. Few can come close to you. This was a lovely tribute to your friend. He would certainly appreciate your kind words. Well done. Rest in peace, Mr. Isaacs, and thank you for your wisdom and insight regarding a 22-yr.-old young man. We are truly grateful. Spot on, Sandy! Well said, and quite a tribute to Keith. Everything connected. Gratitude is a beautiful thing! When I was 11-17 I waited for the Newsday paper boy to deliver Stan Issacs to me; his creative columns inspired me; I went on to be a reporter with the N Y Journal-American and now, after retiring in 2000 from my English Prof post at SFSU, I am back at it, imitating and celebrating Stan in my weekly column at the Bosox Injection website. He inspired a generation of writers. Glenn Brenner. Sportscaster’s voice non pariel. I think my head resonates to that tone. I never knew of Isaacs. Everyone knows Ebert. It’s good weather for remembering great people. My family moved to LI in 1969 and I started reading Newsday. 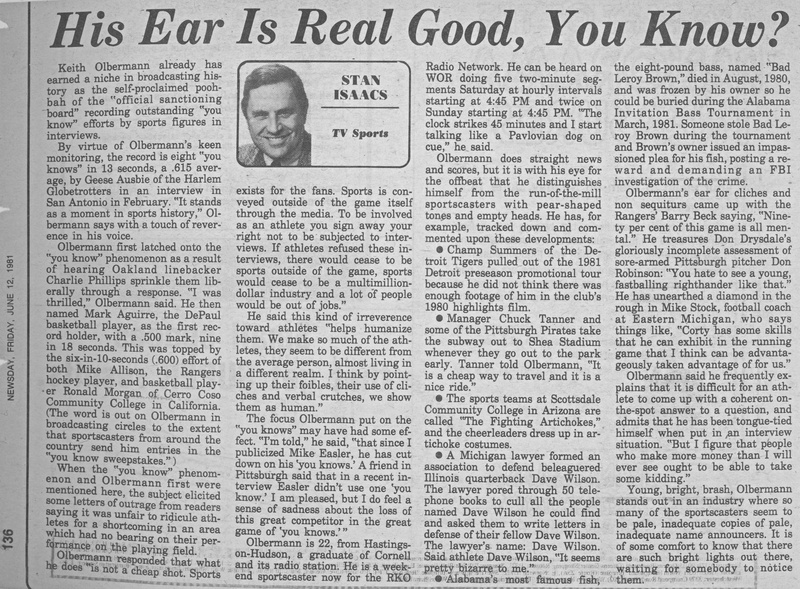 I loved reading Stan Isaacs columns. They were special treats. He was one of a select few who wrote for either Newsday or the Daily News whose columns I read religiously. Jack Lang was another. Thank you for taking us behind the page to reveal something about Stan Isaacs, himself. He sounds as special as was his writing. That is a beautiful story. The word that is getting under my skin these days is “Actually.” The use of the word at the beginning of a sentence and the end of one. Anyone else picking up on the use of the word? I always find, whatever you express, very compelling. Sorry for your loss. 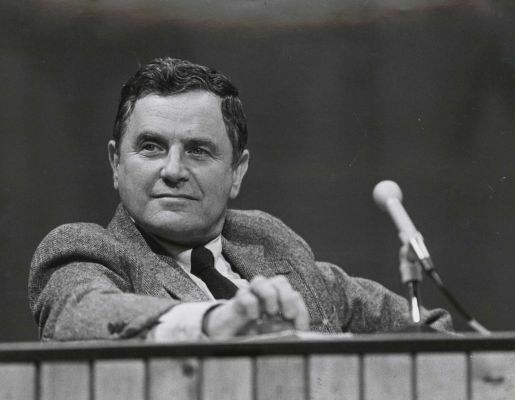 I started reading Stan Isaacs when I went to graduate school at Columbia and Newsday published in the city. After that, I read him whenever I could and welcomed his move to thecolumnists.com. We’ll miss not just the IRED’s, but wonderful writing and wonderful thinking, and, Mr. Olbermann, you did him proud in a lot of different ways, including with this tribute. Stupid Troll, thought you were going to do us all a favor? Have you already forgotten? Crawl back under your bridge and go back to doing what you really do best; exposing yourself to passing strangers. And, once again, this blog is filled up by Trolls and history’s responses to said Trolls. As even the Trolls noted; there is no moderator here. If there was a moderator both History and de Trolls would be given the boot. Just saying. You’re the biggest douche bag on the face of the earth. Make her shocking most of, isn’t the dead of remaining Qian, but the Qin Dynasty is this lately- come public security.She sees very clearly, Qin Dynasty for saving remaining Qian, together jumped out from the upstairs.But don’t know why, the Qin Dynasty was unexpectedly and luckily blown into the classroom of the seventh floors by a burst of strong breeze in.But remaining Qian have no so lucky, she falls off to fall a ground and turns to make a ghost. VPN is the way to go. The point is this…do not come here expecting to greatly lower your cost of living. need to jailbreak the device first.